There has been quite a lot of interest in this article recently, so I have republished it for any new “Defining the Narrative” readers, or those who may have missed it or would like a refresher. One of my first articles, it has continued to grow popularity. I recently read the book Milestones by Seyyid Qutb. He is considered by some to be the father of the modern Islamic revolution. Milestones was written from an Egyptian prison in 1964. Qutb had spent 2 years in America several years prior, and reported that his prejudices had been confirmed concerning American depravity. America was ripe for the picking. Qutb’s book wasn’t his first, or his longest work, but perhaps Milestones has had the most impact on the modern world. Although some attribute the modern “Islamic Revolution” to this book, that was not exactly the outcome that Qutb desired. Actually, Islamic Revival was his desire and purpose. Milestones was to be the “vanguard” publication to accomplish this. By initiating a revival of Islam among those who profess it, the natural outcome would then be an alteration of the course of human history. Revolution would not be necessary, but world conquest would be at hand. Revival of the fundamentals of Islam within the culture itself would make Islam irresistible in both principle and on the battlefield. A revived and truly Muslim population in the cause of Allah would be invincible. Islam had, according to Qutb, become compromised by moderates and liberals (Muslim) who, for various reasons, embraced Western Culture and prosperity. Obviously the development of Middle Eastern oil fields was responsible for most of this merging of the two worlds, and the petro-dollar brought an ancient culture roaring forward into the industrialized 20th century with so much speed, there was no time for gradual adaptation. Yet today, there is a stark contrast within these countries, and without the petro-dollar they would shrivel back into the desert survivalist culture of a mere century ago. Qutb’s call to all Islam was a return to Fundamentalism, that being the founding principles of Islam. This “revival” within Islam would then lead to political reformation in Islamic countries, bringing to bear those governments which had established within their own constitutions; that Islam is the official state religion and Islamic jurisprudence (Shari’a) is the law of the land. This move to “right” Egypt’s secularized government along with his fellow members of “Muslim Brotherhood” is the reason he was imprisoned and consequently executed by “The Arab Republic of Egypt” in 1966. Egypt was but one of the Islamic Republics which had not implemented Shari’a as enumerated in its own constitution. Turkey is the most widely known which has managed, even today, to maintain a modicum of separation (though currently very tenuous) between religion and state; for practical purposes a secularized government. The United States has, in fact, assisted in the establishment of two of the latest Islamic Republics of the world; Iraq and Afghanistan, complete with constitutions which name Islam as the official religion. In other words, you can believe whatever you want, but you will live according to Shari’a Law. This is the mission of Islam defined: Not to convert the entire world to Islamic belief; but to bring the entire world under submission to Shari’a, or Islamic Law. Seyyid further explains, “But any place where the Islamic Shari’a is not enforced and where Islam is not dominant becomes [Dar ul Harb]”. This book, the “vanguard” of modern Islamic Fundamentalism, written in 1964 has inspired Jihadists, Mujahidin and Shahada (“martyrs” aka suicide bombers) for 45 years. 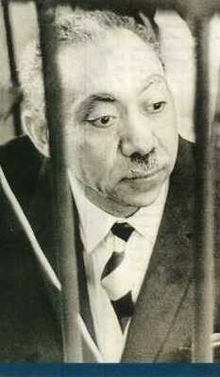 Seyyid Qutb is considered Shahid by fundamentalist Muslims around the world. I have read several books from and on Islam and would recommend Milestones as essential reading for one who desires to understand the purpose and designs of modern Islam and the resolve of Islamic fundamentalists.